projectiondesign® has announced that the new F21 projector is shipping. “Renowned for having the world’s most advanced projector technologies, the F21 reproduces intense graphics reproduction and reliability with no compromise in image quality. The F21 meets the specific needs and expectations of professional corporate users and is available at an attractive price point,’ says Fredrik Brostrøm-Hansen, Product Marketing Manager at projectiondesign. 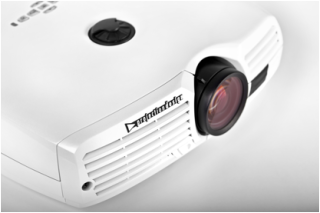 Designed in a pearl white cabinet, the projector will compliment any boardroom or meeting room environment. The new high performance F21 single-chip DLP® projector comes with full HD native 1080p resolution. It incorporates a high quality zoom lens and a long life lamp. The projector uses projectiondesign’s RealColor™ color management suite, ideal for stand-alone or multi-channel blended environments. For greater accuracy, RealColor allows the user to define a desired white point, match the colors from the projector to the picture on the screen or a print for true color imaging. “Now that the F21 projector is shipping we are able to deliver an even stronger product offering for the important corporate meeting room and collaboration space. With the F21 what you see is what you get, and that is no less than the highest performing quality on-screen image!” adds Brostrøm-Hansen. The F21 projector comes with projectiondesign’s standard 3-year 24/7 warranty which can be extended up to five years, all service inclusive.